CHICAGO, IL--(Marketwired - Apr 15, 2015) - Trillium CNG, a business unit of Integrys Energy Group, Inc. (NYSE: TEG), has been recognized with the 2015 "Supplier of the Year" award by the fleet division of Frito-Lay North America. 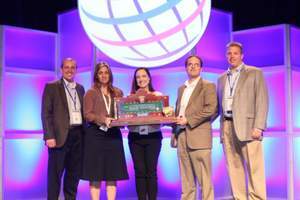 Jennifer De Tapia, director of market development, accepted the honor on behalf of Trillium CNG from Ken Marko, Sr. Sustainability Manager for the Frito-Lay fleet division, at PepsiCo's Annual Fleet Summit held earlier this year in San Antonio, Texas. The annual event was attended by leading suppliers. Trillium CNG earned the award for their superior customer service and operational excellence in supporting Frito-Lay's public access compressed natural gas (CNG) station network. Trillium CNG currently supports nine public stations and one private station for the Frito-Lay fleet. In 2014, more than 2.2 million gasoline gallon equivalents (GGE) were dispensed to Frito-Lay vehicles at Trillium CNG stations and the stations had uptime rates approaching 100%. Additionally, Frito-Lay recognized Trillium CNG specifically for its proactive safety procedures and on-site safety training. "Providing customers with an exceptional fueling experience, every time, is at the core of what we are all about," said Mary Boettcher, president, Trillium CNG. "There is no higher praise than this type of recognition from a customer, especially when they recognize one of our core values -- a focus on safety." Frito-Lay North America selected Trillium CNG as a station partner to build a public fueling infrastructure to serve its fleet of heavy-duty, Class-8 CNG tractor-trailers. Based in Plano, Texas, Frito-Lay is a division of PepsiCo and has one of the largest CNG fleets in the U.S.
Trillium CNG is a leading provider of CNG to fleets, and also offers complete facility design, construction, operation and maintenance services. Our focus is on fueling heavy-duty fleets that require high-performance solutions. Trillium CNG is a business unit of Integrys Energy Group Inc. (NYSE: TEG). For more information, visit www.TrilliumCNG.com. Integrys Energy Group, Inc. is a diversified energy holding company with regulated natural gas and electric utility operations (serving customers in Illinois, Michigan, Minnesota and Wisconsin), an approximate 34 percent equity ownership interest in American Transmission Co. (a federally regulated electric transmission company) and non-regulated energy operations. For more information, visit www.integrysgroup.com.